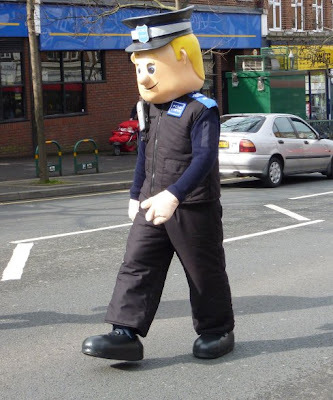 I was inspired by The Brinkster's photo of 'PCSO Steve', who was out terrifying the crap out of small children on Central Road yesterday. I think all PCSO's should wear these costumes whilst on duty. Their imposing height would go some way to compensate for the lack of powers of arrest, and if things do turn violent (which is unlikely as it's hard to be aggressive towards a an 8ft tall officer with a perma-grin and comedy shoes) then they would be nicely cushioned from any blows and could diffuse the situation by giving the reprobates a comedy clip round the ear with their soft foamy hands. I think the idea has legs.